Kelly's first spaceflight was as pilot of Space Shuttle Discovery during STS-103 in December 1999. This was the third servicing mission to the Hubble Space Telescope, and lasted for just under eight days. Kelly's second spaceflight was as mission commander of STS-118, a 12-day Space Shuttle mission to the ISS in August 2007. Kelly's third spaceflight was as a crewmember on Expedition 25/26 on the ISS. He arrived at the ISS aboard Soyuz TMA-01M on 9 October 2010, and served as a flight engineer until he took over command of the station on 25 November 2010 at the start of Expedition 26. Expedition 26 ended on 16 March 2011 with the departure of Soyuz TMA-01M. In November 2012, Kelly and Russian cosmonaut Mikhail Korniyenko were selected for a year-long mission to the ISS. Their year in space began with the launch of Soyuz TMA-16M on March 27, 2015, and they remained on the station for Expeditions 43, 44, 45, and 46. The mission ended on March 1, 2016, with the departure of Soyuz TMA-18M from the station. Scott Kelly retired from NASA in 2016. 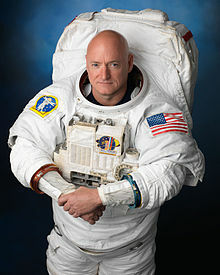 Kelly's identical twin brother, Mark Kelly, is also a retired astronaut. After attaining the rank of captain in the U.S. Navy, Kelly retired from active duty on June 1, 2012 after 25 years of naval service. He flew over 8,000 hours in more than 40 aircraft and accomplished over 250 carrier landings throughout his career. After Kelly's first flight on STS-103, he served as NASA's director of operations in Star City, Russia. :237–238 He served as back-up crew member to Peggy Whitson for ISS Expedition 5, and to Tracy Caldwell Dyson on Expedition 23/24. :242–244, 290 After the Space Shuttle Columbia disaster, Kelly coordinated airplane and helicopter searches for debris. :251–253 He also served as the Astronaut Office Space Station Branch Chief. In September 2002, Kelly served as the commander of the NEEMO 4 mission aboard the Aquarius underwater laboratory, 4 mi offshore from Key Largo. The NEEMO 4 crew spent five days saturation diving from Aquarius as a space analogue for working and training under extreme environmental conditions. The mission was delayed due to Hurricane Isidore, reducing the underwater duration to five days. In April 2005, Kelly was a crew member on the three-day NEEMO 8 mission. During the NEEMO 8 mission, the crew practiced construction while conducting an extravehicular activity (EVA) using a remotely operated underwater vehicle, and training with the Exploration Planning Operations Center at the Johnson Space Center. In late 2007, Kelly was assigned to Expeditions 25 and 26.:262–263 Kelly lifted off aboard Soyuz TMA-01M from the Baikonur Cosmodrome in Kazakhstan at 7:10 pm EDT on October 7, 2010 along with cosmonauts Aleksandr Kaleri and Oleg Skripochka. TMA-01M was the first launch of an updated model of the Soyuz spacecraft, and featured improved guidance, environmental control, and flight-control systems. Kelly, Kaleri, and Skripochka arrived at the ISS on October 9, 2010, and joined Commander Douglas H. Wheelock and flight engineers Shannon Walker and Fyodor Yurchikhin on Expedition 25. During Kelly's time aboard the ISS, the crew supported about 115 scientific experiments, including an improved water-recycling machine, the Boiler Experiment Facility to test heat transfer in microgravity, and a Japanese experiment to research vegetable growth in microgravity. During Expedition 25, cosmonauts Yurchikhin and Skripochka conducted an EVA to install a workstation on the Zvezda module, install handrails, and removed three Russian experiments. 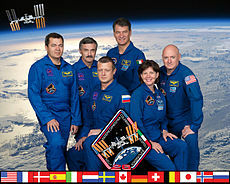 The crew of Expedition 24/25 returned to Earth on November 25, 2010 aboard Soyuz TMA-19; Wheelock transferred command of the station to Kelly. On December 17, 2010, Soyuz TMA-20 arrived at the station with the crew of Expedition 26/27 cosmonaut Dmitri Kondratyev, NASA astronaut Catherine Coleman, and ESA astronaut Paolo Nespoli. 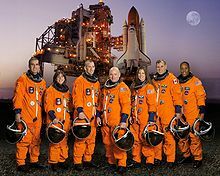 The crew of STS-133 aboard Discovery arrived at the station February 26, 2011. The crew of STS-133 performed two EVAs to replace a pump and install the Permanent Multipurpose Module. Discovery undocked from the ISS on March 7, 2011, and landed for the final time two days later. On January 8, 2011, while Kelly was on the ISS, Kelly's sister-in-law Congresswoman Gabrielle Giffords was shot in Tucson. Soyuz TMA-01M landed in Kazakhstan on March 16, 2011, and Kelly travelled to TIRR Memorial Hermann in Houston to see Giffords and Mark. Mark was the commander of STS-134, the final flight of Endeavour, and launched on May 16, 2011, with Giffords in attendance. :300–301, 308–309 STS-134 had originally been scheduled to launch in February 2011, which would have made the Kelly brothers the first twins to fly together in space. 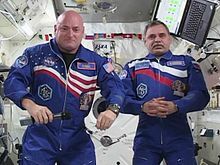 Kelly, Korniyenko, and Gennady Padalka launched aboard Soyuz TMA-16M spacecraft from the Baikonur Cosmodrome in Kazakhstan at 3:42 pm EDT on March 27, 2015. TMA-16M docked with the ISS at 9:36 pm EDT, and the crew joined the Expedition 43 crew of commander Terry Virts and flight engineers Anton Shkaplerov and Samantha Cristoforetti. Once aboard, the crew performed scientific experiments, including evaluations of the fluid shifts in their bodies to determine their effects on eyesight, and repeated collections of blood and urine for chemical analysis. During Expedition 43, the ISS received supplies from the SpaceX Dragon CRS-6 mission, but lost their resupply due to the failure of the Russian Progress 59 spacecraft. Expedition 44 began on June 11, 2015, when Virts transferred command of the ISS to Padalka, and Soyuz TMA-15M landed in Kazakhstan at 9:44 am EDT. Soyuz TMA-17M docked with the ISS on July 22, 2015, bringing NASA astronaut Kjell Lindgren, Russian cosmonaut Oleg Kononenko, and JAXA astronaut Kimiya Yui to join Expedition 44. During Expedition 44, the ISS was resupplied by the JAXA HTV-5 and the Russian Progress 60 vehicles; the crew experienced another loss of a resupply mission with the SpaceX CRS-7 failure. On August 28, 2016, the crew of Soyuz TMA-16M undocked and subsequently docked the spacecraft to a different port to prepare for the arrival of Soyuz TMA-18M. Soyuz TMA-18M docked with the ISS on September 4, 2015, bringing Russian cosmonaut Sergey Volkov, ESA astronaut Andreas Mogensen, and Kazakh cosmonaut Aidyn Aimbetov to the station. One of Soyuz TMA-18M's missions was to deliver a new Soyuz to the station for the return of Kelly, Korniyenko, and Volkov in March 2016; they could not return on Soyuz TMA-16M due to the 200-day orbital lifespan of a Soyuz. Padalka, Morgensen, and Aimbetov departed from the ISS on September 11, 2015, and landed in Kazakhstan in Soyuz TMA-16M. Expedition 45 began on September 11, 2015, when Padalka transferred command of the station to Kelly. During the expedition, the ISS crew was resupplied by the Progress 61 and the Cygnus CRS OA-4 missions. On October 28, 2015, Kelly and Lindgren performed an EVA to service the Canada Arm 2, the Alpha Magnetic Spectrometer, and to install cables for the International Docking Adapter for the Boeing CST-100 Starliner and SpaceX Crew Dragon spacecraft. Kelly and Lindgren performed a second EVA on November 6, 2015, to service the ammonia cooling system on the P6 truss. Expedition 46 began on December 11, 2015, with the departure of Soyuz TMA-17M, carrying Lindgren, Kononenko, and Yui. On December 15, 2015, NASA astronaut Timothy Kopra, ESA astronaut Timothy Peake, and Russian cosmonaut Yuri Malenchenko joined Expedition 46 as flight engineers after Soyuz TMA-19M docked with the ISS. On December 21, 2015, Kelly and Kopra performed an unscheduled EVA to release the brake handles on the Mobile Transporter rail car for the Canada Arm 2, which had unexpectedly stopped when it was remotely commanded by the flight controllers. After the successful repair of the Mobile Transporter, the ISS crew was resupplied on December 23, 2015, by the Progress 62 spacecraft. On January 15, 2016, Kopra and Peake performed another EVA and successfully replaced a voltage regulator, but were forced to return early after water began forming inside of Kopra's helmet. On January 8, 2016, Kelly appeared in the thank-you note segment of The Tonight Show Starring Jimmy Fallon, with the first ever thank-you note from space. Russian cosmonauts Malenchenko and Volkov conducted an EVA on February 3, 2016, to retrieve experiments and photograph the exterior portions of the Russian segment of the station. On March 1, 2016, Kelly transferred command of the ISS to Kopra, and returned to Earth alongside Korniyenko and Volkov aboard Soyuz TMA-18M. The spacecraft landed in Kazakhstan, and Kelly returned to Houston the following day. In addition to the biological tests conducted on all astronauts on the station, Kelly also participated in comparative study on the effects of spaceflight with his identical twin Mark as the ground control subject. Kelly's physical, cognitive, and genetic traits were measured before and after the flight. Within several months after returning to Earth, Kelly had adapted to living in gravity. Genetic tests revealed changes in Kelly's gene expression, and an increase in the length of his telomeres relative to before his flight. On March 12, 2016, Kelly announced his retirement from NASA, effective April 1, 2016. 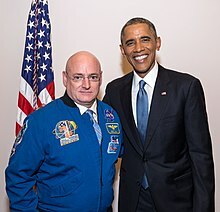 Scott Kelly was appointed United Nations Champion for Space by the United Nations Office for Outer Space Affairs (UNOOSA), in November 2016, to assist in raising awareness of UNOOSA outreach and activities. On June 19, 2018, Kelly spoke at UNISPACE50+ conference in Vienna. In October 2017, Kelly released his memoir, Endurance: A Year in Space, a Lifetime of Discovery. On April 25, 1992, Kelly married his first wife, Leslie (née Yandell), whom he had met while stationed in Virginia Beach. :160, 165–166 Together, they have two children. :168, 255 Kelly and Leslie divorced in 2009.:268–271 In July 2018, Kelly married Amiko Kauderer, a public affairs officer for NASA. His sister-in-law is Gabrielle Giffords, a former congresswoman from Arizona. :262 In February 2019, his brother Mark announced his candidacy for US Senator from Arizona. Kelly received an honorary Korolev Diploma from the Federation Aeronautique Internationale (1999) and an Honorary Doctorate of Science degree from the State University of New York (2008). Kelly was featured on the cover of Time on December 29, 2014. In 2015, Kelly was listed as one of the Time 100 Most Influential People . Kelly is an associate fellow of the Society of Experimental Test Pilots and a member of the Association of Space Explorers. Kelly, Scott (2017). Endurance: A Year in Space, a Lifetime of Discovery. With Margaret Lazarus Dean. New York: Alfred A. Knopf. ISBN 978-1-5247-3159-5. Kelly, Scott (2017). My Journey to the Stars. With Emily Easton ; illustrated by André Ceolin. New York: Crown Books for Young Readers. ISBN 978-1-5247-6377-0. Kelly, Scott (2018). Endurance, Young Readers Edition: My Year in Space and How I Got There. With Margaret Lazarus Dean ; adapted for young readers by Emily Easton. New York: Crown Books for Young Readers. ISBN 978-1-5247-6424-1. Kelly, Scott (2018). Infinite wonder : an astronaut's photographs from a year in space. New York: Alfred A. Knopf. ISBN 978-1-5247-3184-7. ^ Calandrelli E, Escher A (December 16, 2016). "The top 15 events that happened in space in 2016". Archived from the original on December 20, 2016. Retrieved December 16, 2016. ^ a b Ryba, Jeanne (November 23, 2007). "STS-103". Mission Archives. NASA. Retrieved December 10, 2018. ^ a b "STS-118: Build the station. Build the future" (PDF). NASA. July 2007. Retrieved December 5, 2018. ^ a b Garcia, Mark (November 16, 2018). "International Space Station Expedition 25". NASA. Retrieved December 10, 2018. ^ Garcia, Mark (November 16, 2018). "International Space Station Expedition 26". NASA. Retrieved December 10, 2018. ^ Kauder, Amiko (November 26, 2010). "Expedition 25 Returns Home". NASA. Retrieved December 10, 2018. ^ a b Kauderer, Amiko (March 16, 2011). "Expedition 26 Returns Home". NASA. Retrieved December 11, 2018. ^ Buck, Joshua; Bolden, Jay; Vedishcheva, Anna (November 26, 2012). "NASA, Roscosmos Assign Veteran Crew to Yearlong Space Station Mission NASA.gov". NASA. Retrieved December 10, 2018. ^ a b Kramer, Miriam (March 28, 2015). "One-Year Crew Begins Epic Trip on International Space Station". Space.com. Retrieved December 11, 2018. ^ a b c d e f g "Scott J. Kelly (Captain, USN, Ret.) NASA Astronaut" (PDF). NASA. February 2016. Retrieved December 5, 2018. ^ Garcia, Mark (March 1, 2016). "Veteran Station Crew Returns to Earth after Historic Mission". NASA. Retrieved December 7, 2018. ^ Seppala, Mark (March 12, 2016). "Record-breaking astronaut Scott Kelly retiring this April". Engadget. Retrieved December 1, 2018. ^ "Mark Kelly's Official NASA Bio". NASA. July 2011. Retrieved December 5, 2018. ^ Zimmer, Carl (12 April 2019). "Scott Kelly Spent a Year in Orbit. His Body Is Not Quite the Same - NASA scientists compared the astronaut to his earthbound twin, Mark. The results hint at what humans will have to endure on long journeys through space". The New York Times. Retrieved 12 April 2019. ^ "Scott Joseph Kelly". Biographies of U.S. Astronauts. Spacefacts. August 25, 2018. Retrieved November 8, 2018. ^ Rose, Lisa (April 27, 2012). "Twin astronauts remember their mother, West Orange's first female police officer". NJ.com. ^ a b c d e f g h i j k l m n o p q r s t u v w Kelly, Scot; Dean, Margaret (2017). Endurance: A Year in Space, a Lifetime of Discovery. New York City: Alfred A. Knopf. ISBN 978-1-5247-3159-5. ^ "Expedition 23 and 24" (PDF). Press Kit. NASA. April 2010. Retrieved December 7, 2018. ^ Dunbar, Brian (June 9, 2014). "NEEMO History". NASA. Retrieved December 7, 2018. ^ NASA (April 21, 2011). "Life Sciences Data Archive : Experiment". NASA. Archived from the original on March 22, 2012. Retrieved September 22, 2011. ^ Bergin, Chris (August 21, 2007). "Endeavour's performance during re-entry classed as phenomenal". NASA. Retrieved December 5, 2018. ^ Ryba, Jeanne (November 23, 2007). "STS-118". Mission Archives. NASA. Retrieved December 6, 2018. ^ a b "Expedition 25 and 26" (PDF). Press Kit. NASA. October 2010. Retrieved December 10, 2018. ^ Kauderer, Amiko (October 23, 2010). "Three New Station Crew Members Launch from Kazakhstan". NASA. Retrieved December 7, 2018. ^ Kauderer, Amiko (August 4, 2010). "NASA Preflight Interview: Scott Kelly". NASA. Retrieved December 5, 2018. ^ "Soyuz TMA-M manned transport vehicle of a new series". S.P. Korolev Rocket and Space Corporation. 2018. Retrieved December 7, 2018. ^ "NASA Assigns Space Station Crews, Updates Expedition Numbering". NASA. October 12, 2010. Retrieved December 10, 2018. ^ Kauderer, Amiko (December 20, 2010). "New Expedition 26 Trio Arrives at Station". NASA. Retrieved December 10, 2018. ^ Siceloff, Steve (August 7, 2017). "Discovery Makes Last Mission a Flight to Remember". NASA. Retrieved December 10, 2018. ^ Myers, Amanda (March 21, 2011). "Giffords gets visit from husband's twin brother". Arizona Republic. Retrieved December 1, 2018. ^ Kauderer, Amiko (June 9, 2011). "STS-134". NASA. Retrieved December 10, 2018. ^ Robinson, Ashle (August 26, 2010). "NASA's First Twins to Fly in Space Together". NASA. Retrieved December 10, 2018. ^ Davis, Jason (March 25, 2015). "One-Year ISS Mission Preview: 28 Experiments, 4 Expeditions and 2 Crew Members". The Planetary Society. Retrieved December 5, 2018. ^ Pearlman, Robert Z. (January 21, 2015). "Obama Hails NASA Astronaut Set for 1-Year Space Voyage in State of the Union". Space.com. Purch. Retrieved March 3, 2016. ^ Garcia, Mark (March 27, 2015). "Crew Begins Year In Space". NASA. Retrieved December 10, 2018. ^ "Expedition 43" (PDF). Mission Summary. NASA. 2015. Retrieved December 10, 2018. ^ Garcia, Mark (April 17, 2015). "Robotic Arm Captures Dragon". Space Station. NASA. Retrieved December 11, 2018. ^ Hout, Dan (April 30, 2015). "Progress 59 Update Apr. 30, 2015". Space Station. NASA. Retrieved December 11, 2018. ^ Garcia, Mark (June 11, 2015). "Soyuz Crew Returns Home after 199 Days in Space". Space Station. NASA. Retrieved December 11, 2018. ^ Garcia, Mark (July 22, 2015). "Soyuz Rocket Launches Expedition 44 Trio to Space". Space Station. NASA. Retrieved December 11, 2018. ^ Garcia, Mark (August 24, 2015). "Japan's Cargo Ship Installed on Station". Space Station. NASA. Retrieved December 11, 2018. ^ Garcia, Mark (July 5, 2015). "Russian Cargo Craft Arrives at Space Station". Space Station. NASA. Retrieved December 11, 2018. ^ Siceloff, Steven (June 28, 2015). "NASA Administrator's Statement on CRS-7". SpaceX. NASA. Retrieved December 11, 2018. ^ Garcia, Mark (August 28, 2015). "Completed Soyuz Relocation Sets Stage for New Crew". Space Station. NASA. Retrieved December 11, 2018. ^ Garcia, Mark (September 4, 2015). "Soyuz Crew Docks Delivering New Science to Station". Space Station. NASA. Retrieved December 11, 2018. ^ Greshko, Michael (October 11, 2018). "Soyuz rocket accident could spell trouble for space station". Science. National Geographic. Retrieved December 11, 2018. ^ a b Garcia, Mark (September 11, 2015). "Three Soyuz Crew Members Wrap Up Mission on Space Station". Space Station. NASA. Retrieved December 11, 2018. ^ Garcia, Mark (October 1, 2015). "Space Station Receives Express Delivery in Six Hours". Space Station. NASA. Retrieved December 11, 2018. ^ Garcia, Mark (December 9, 2015). "Astronaut Kjell Lindgren Captures Cygnus Spacecraft". Space Station. NASA. Retrieved December 11, 2018. ^ Garcia, Mark (October 28, 2015). "NASA Astronauts Complete Their First Spacewalk". Space Station. NASA. Retrieved December 11, 2018. ^ a b Garcia, Mark (December 21, 2015). "Astronauts Make Quick Work of Short Spacewalk". Space Station. NASA. Retrieved December 11, 2018. ^ Garcia, Mark (November 6, 2015). "Pair of NASA Astronauts Wrap Up Second Spacewalk". Space Station. NASA. Retrieved December 11, 2018. ^ Garcia, Mark (December 11, 2015). "Soyuz With Expedition 45 Trio Lands After 141 Days in Space". Space Station. NASA. Retrieved December 11, 2018. ^ Garcia, Mark (December 15, 2015). "New Crew Arrives at Station for Six-Month Mission". Space Station. NASA. Retrieved December 11, 2018. ^ Humphries, Kelly (December 18, 2015). "Unscheduled Spacewalk Likely on Monday". Space Station. NASA. Retrieved December 11, 2018. ^ Garcia, Mark (December 23, 2015). "Fourth Russian Cargo Ship This Year Docks to Station". Space Station. NASA. Retrieved December 11, 2018. ^ Hout, Dan (January 15, 2016). "Spacewalk Ends Successfully But Early After Water Detected in Helmet". Space Station. NASA. Retrieved December 11, 2018. ^ Fallon, Jimmy [@FallonTonight] (January 8, 2016). "Our first ever Thank You Note from outer space! Thanks, Scott Kelly (@StationCDRKelly)! #FallonTonight" (Tweet). Retrieved December 10, 2018 – via Twitter. ^ Garcia, Mark (February 3, 2016). "Second Spacewalk of Year Complete". Space Station. NASA. Retrieved December 11, 2018. ^ Garcia, Mark (March 1, 2016). "Veteran Station Crew Returns to Earth after Historic Mission". Space Station. NASA. Retrieved December 11, 2018. ^ Schierholz, Stephanie; Dean, Brandi; Hout, Dan (March 1, 2016). "Update on NASA Astronaut Scott Kelly's Return to Houston" (Press release). NASA. Retrieved December 11, 2018. ^ Edwards, Monica; Abadie, Laurie. "NASA Twins Study Confirms Preliminary Findings". NASA. Retrieved December 5, 2018. ^ Drake, Nadia (March 15, 2018). "No, Scott Kelly's Year in Space Didn't Mutate His DNA". National Geographic. Retrieved December 5, 2018. ^ Edwards, Monica; Abadie, Laurie (August 16, 2018). "NASA Twins Study Investigators to Release Integrated Paper in 2018". Human Research Strategic Communications. NASA. Retrieved December 11, 2018. ^ Dunbar, Brian (August 7, 2017). "Astronaut Scott Kelly to Retire from NASA in April". NASA. Retrieved December 6, 2018. ^ "Former astronaut Scott Kelly is United Nations Champion for Space". United Nations Office for Outer Space Affairs (UNOOSA). November 22, 2016. Retrieved December 1, 2018. ^ "If we can build the International Space Station, 'we can do anything' – UN Champion for Space". UN News. June 19, 2018. Retrieved December 11, 2018. ^ Schaub, Michael (April 6, 2016). "Astronaut Scott Kelly will write a book about his year in space". Los Angeles Times. ISSN 0458-3035. Retrieved December 1, 2018. ^ Kelly, Scott [@StationCDRKelly] (July 18, 2018). ". @amikokauderer and I are happily married! We were very honored to have @SylvesterTurner officiate our wedding here in our hometown @HoustonTX overlooking @DiscoveryGreen last weekend. We'll be sharing more from our weekend wedding & what's next for us soon!" (Tweet). Retrieved December 6, 2018 – via Twitter. ^ O'Connor, Kyrie (May 28, 2015). "Out of this world: Astronaut Kelly, girlfriend learn to live apart". Lifestyle. Houston Chronicle. Retrieved December 11, 2018. ^ Burns, Alexander (February 12, 2019). 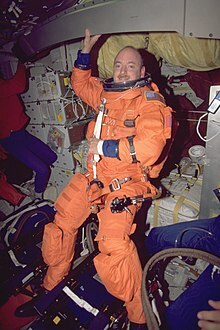 "Mark Kelly to Run for Senate in Arizona". The New York Times. Retrieved March 7, 2019. ^ Laurent, Oliver (December 18, 2014). "Go Behind TIME's NASA Cover with Photographer Marco Grob". Time Magazine. Retrieved December 11, 2018. ^ Glenn, John (April 16, 2015). "Scott Kelly". The 100 Most Influential People. Time. Retrieved December 10, 2018. Wikimedia Commons has media related to Scott J. Kelly.